MEYERS, Calif. — For residents here, it’s a fact of life: Don’t leave home on Sundays unless you absolutely need to. Not adhering to that rule is a near-guarantee that you will spend an infuriating amount of time in traffic — a problem caused by visitors who, in the mass exodus following a weekend in Tahoe, take to neighborhood streets in an attempt to dodge traffic on U.S. 50. It’s a problem that has existed for years but is becoming increasingly worse, with many citing the increasing use of GPS and map apps as the main culprit. However, the county may have found a way to reduce that traffic. It’s a tactic that Rafael Martinez, El Dorado County director of transportation, refers to as “the nudge,” and it works by essentially creating the appearance that a road is closed when it’s really not. Speaking at a special town hall Wednesday, Feb. 28, Martinez explained that while it is illegal in California to close a public road to only a certain group of people (non-residents in this case), it is perfectly legal to try and encourage certain people to travel in a specific direction. This can be done by using detour signs and traffic barriers that still allow traffic to pass through. The thought is that visitors will see the detour signs and barriers and decide to take the detour, which would direct them to a primary travel road. Meanwhile residents will know that they can travel past the barrier. As part of a pilot program, the tactic will be implemented Sunday, March 4, on Lake Tahoe Boulevard at Sawmill Road. Detour signs will be posted suggesting that motorists heading toward Meyers take a left onto Sawmill, rather than stay on Lake Tahoe Boulevard, which becomes North Upper Truckee Road. The barriers will be stationed on Lake Tahoe Boulevard at that intersection with Sawmill. “The nudge” is by no means a solution to the problem, Martinez admitted. As California Highway Patrol Lt. Terry Lowther pointed out, the overall problem is that there are too many cars traveling on roads that were built for a much smaller number of vehicles. But if there are actions that can potentially help alleviate traffic on neighborhood streets, it is worth trying. 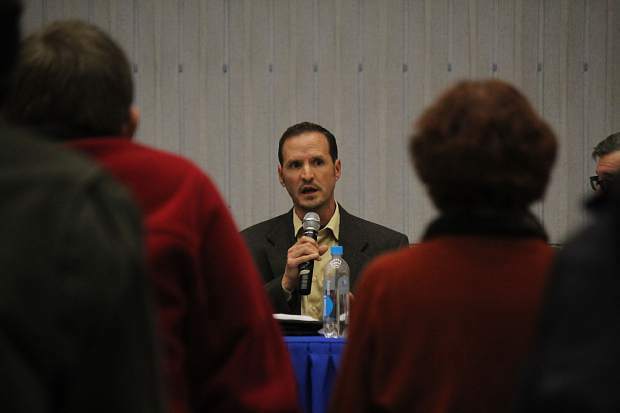 None of the nearly 60 people in attendance at the town hall objected to the proposal. Rather, a burst of applause broke out when Martinez stated he could start the pilot program this weekend if there were no objections. After being given a $200 cost estimate for the whole project, El Dorado County CEO Don Ashton told Martinez to go for it. Still, many of those who commented during the town hall offered up what they perceived as causes of the problem and possible solutions. Kenny Curtzwiler, who is running against Novasel and several others in the race for District 5 supervisor, said that if CHP identifies the route that goes around the agricultural inspection station in Meyers as illegal, then it by law can be removed from the map that navigation apps rely on. “That is something that can be done right now,” Curtzwiler said. In an effort to explain further, Lt. Lowther said that Curtzwiler was referring to the possibility of uploading electronic closures that would be detected in the navigational app, which would then direct users to a different route — similar to when there is a car crash and a navigation app directs the user to a different route to circumvent the crash. The lieutenant added that he has a future meeting with county personnel to discuss if that would be a viable, and legal, tactic to try. In the meantime, the county will monitor the effectiveness of the nudge. If it proves effective, it could be implemented elsewhere in the county.